Amid a sea of vibrant displays commonly seen during the holiday season is a hidden treasure residing in a small, white building at the corner of Moorestown-Mt. Laurel and Hainesport-Mt. Laurel roads. Farmers Hall, a historic building constructed in 1866, opens its doors to the Mt. Laurel community each December for its annual Holiday Open House. According to historical society president Fran Daily, the open house has been a great way to invite the community to the hall. “We’ve been doing this event for at least the past 10 years,” she said. The historical society partners with the Mt. Laurel Garden Club for this event each year. 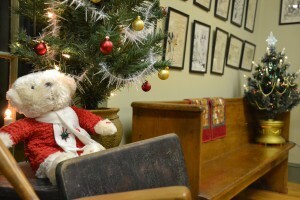 One of the garden club’s holiday projects is the decoration of open houses across the Mt. Laurel area, including at Farmers Hall, the Alice Paul Institute and Smithville Mansion in Mt. Holly. A different theme is presented at each year’s open house. This year’s theme is trees, with decorative pines of various sizes set up all around the first and second floor of the house. There are also other holiday-themed items. Daily said each year’s theme complements the character of Farmers Hall. There are no flashy lights or extravagant decorations filling the hall. Instead, the style remains classic and blends well with the surroundings. Some of the items, from the furniture to the antique tools on display, harken back more than 100 years in Mt. Laurel’s history. The event not only gives the community a chance to see Farmers Hall decorated for the holidays, but it also serves as exposure for the place serving as Mt. Laurel’s historical museum. Daily said the historical society is dependent on the community to keep Farmers Hall going strong. Many of the items on display came from residents’ donations. Farmers Hall is the reason the Mt. Laurel Historical Society was originally formed. The building served as town hall until the new municipal building was constructed in 1969. The historical society was formed to preserve Farmers Hall for future generations. The house has undergone several projects over the past four decades, including a major renovation in 2002. Daily hopes residents will come to the open house and become interested in helping the historical society, whether through donations, coming to meetings or volunteering for an event. “We’re more than happy to take donations at any time,” she said. Farmers Hall’s open house will take place on Sunday, Dec. 21 from 1 to 4 p.m. Members of the historical society will be on hand to answer any questions residents may have. There is no cost to attend, but donations are appreciated. Residents are also invited to the historical society’s monthly meetings, held at Farmers Hall on the second Tuesday of every month beginning at 7:30 p.m.